A new scheme from Europe’s largest golf club rental business has already secured its first ‘partner’ … just days after its official launch. Clubs to Hire, which has grown year on year since its launch in 2010, is recruiting partner businesses – or entrepreneurial individuals – to act as agents in a number of popular golfing locations. And the first ‘partner’ is Robinson Club Agadir, in Morocco, which will service exclusively that region of the North African country. 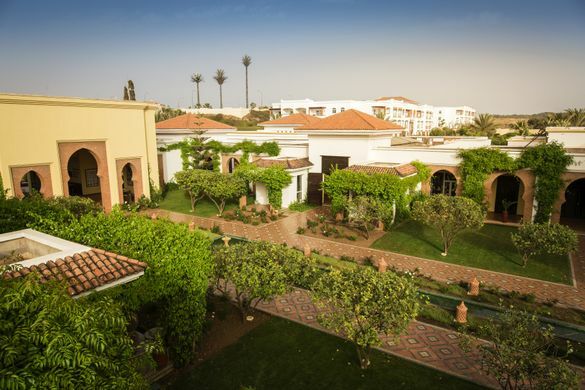 Robinson Club Agadir is a five-star resort which offers preferred rates at five nearby golf clubs – the 36-hole Golf Du Soleil; the 27-hole Les Dunes; the 27-hole Golf De L’Océan Agadir; Tazegzout; and Royal Golf Agadir, which possesses nine holes – with green fees bookable at the resort, while it also offers a shuttle service to each of the courses from the resort. Clubs to Hire’s co-founder, Tony Judge, believes the new ‘lease and rent’ scheme it is now offering to potential partners provides a great opportunity to be part of one of the golf industry’s most positive stories. He explained: “We had only just finalised the small print of the scheme when the Robinson Club Agadir said they wanted to be part of it. We had mentioned previously what we were looking to do, but only in passing. Yet they jumped at the opportunity to have exclusive rights over a territory. “That merely confirms to us we really do have something special to offer potential partners. You always like to think you do, but it takes somebody else to show the same faith in the product that you have yourself. He added: “Since Clubs to Hire launched in 2010 it has seen consistent growth for eight consecutive years and has spawned Clubs to Buy and Clubs to Lease. At a time when much of the news around golf consists of courses closures and a fall in participation it’s great that people out there are demonstrating they want to be part of a success story in the golf industry. Founded in 2010 by Irish entrepreneurs Tony Judge and Gerry McKernan, Clubs to Hire opened its first branch at Faro airport, in Portugal, the same year, offering rental sets of the very latest golf clubs, from just €35 per week. Whether on a golfing holiday or on a business trip, Clubs to Hire saves travellers the hassle of taking golf clubs through busy airport terminals, waiting to collect them at excess luggage, and paying extortionate carriage charges. Ryanair – maximum £65 each way. High-resolution images of Clubs to Hire outlets, personnel and some available product may be downloaded from http://bit.ly/2t9AxMC. For further information please contact Dave Bowers at Azalea on 0044 (0) 1730 711920 or dave@theazaleagroup.com.